Japanese tennis star Kei Nishikori will make his first appearance at Madison Square Garden as one of the participants in the BNP Paribas Showdown, a high-profile tennis exhibition headlining World Tennis Day, a full day of activities that promote tennis worldwide. Nishikori will square off against Juan Martin del Potro, an Argentine pro who defeated Roger Federer to win the 2009 US Open. Other participants include Venus Williams, Garbiñe Muguruza, Nick Kyrgios, Jack Sock, and a matchup of legends to celebrate the tenth anniversary of this annual tennis showcase. To purchase tickets, please visit Ticketmaster and enter the promo code JCNYC to receive a 20% discount! Currently ranked No. 5 in the world, Nishikori is the only male Japanese player ever to be ranked in the top 10. He has 11 singles titles and became the first Asian player to reach a Grand Slam singles final when he upset #1 seed Novak Djokovic in the semifinal of the 2014 US Open. He eventually lost to Marin Cilic in the final, but he established himself as a player to watch. JapanCulture•NYC was fortunate to ask Nishikori a few questions about his participation in the BNP Paribas Showdown and his life in tennis, which he answered via email. JapanCulture•NYC: Madison Square Garden is known as “the World’s Most Famous Arena.” Do you feel different – more nervous, more excited – when you play in venues that have such a long history? Kei Nishikori: I have never been to the Garden, so I am very excited about this event. I don’t usually play a lot of exhibitions, but playing in the Garden is an honor for me. I see it as the most famous arena in the world, and I will definitely be a little anxious walking onto that court for the first time. JC•NYC: Why did you decide to move to Florida to train at the IMG Academy when you were only 14 years old? KN: I moved to the IMG Academy when I was young because it gave me the best chance to become a pro player. There are so many good coaches and players there. There are great nutritionists, trainers, physiotherapist, etc. there. I got the chance with the help of Mr. Morita [Masaaki Morita, former CEO of the Sony Corporation, who started a tennis fund to help potential Japanese tennis stars develop in the U.S.], and I am very grateful for that. It helped me realize my dreams. JC•NYC: During your time training in Florida, what has been the one thing you miss most about Japan? JC•NYC: Michael Chang became your coach in 2014, which was a breakthrough year for you as you and reached your first Grand Slam Final and a #5 world ranking. What is significant about Chang’s coaching style that has allowed you to become more successful? KN: Michael joined Dante [Bottini] and the team in 2014, and it has worked great. The team is really working great. Michael brings a lot of experience that is very helpful. He not only was a great player, but also a great person. I am learning a lot from Michael. JC•NYC: What was your rehabilitation from your 2009 right elbow injury like, and how has your fitness been in recent years? KN: In the last years I have really increased my focus on fitness. It has [given me] better results, and today I feel fitter then ever. JC•NYC: How special will it be for you as a native Japanese to participate in the 2020 Olympics in Tokyo? KN: Tokyo 2020 will be a very special moment for me. It’s always an honor to represent your country, but to do it in your own country is very special. JC•NYC: If you weren’t a professional tennis player, what would your career path be? 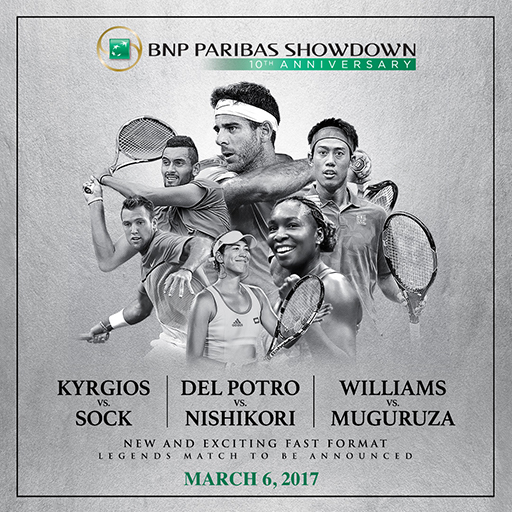 Luckily, you can see Nishikori the tennis player at the World’s Most Famous Arena for the tenth anniversary of the BNP Paribas Showdown on March 6.